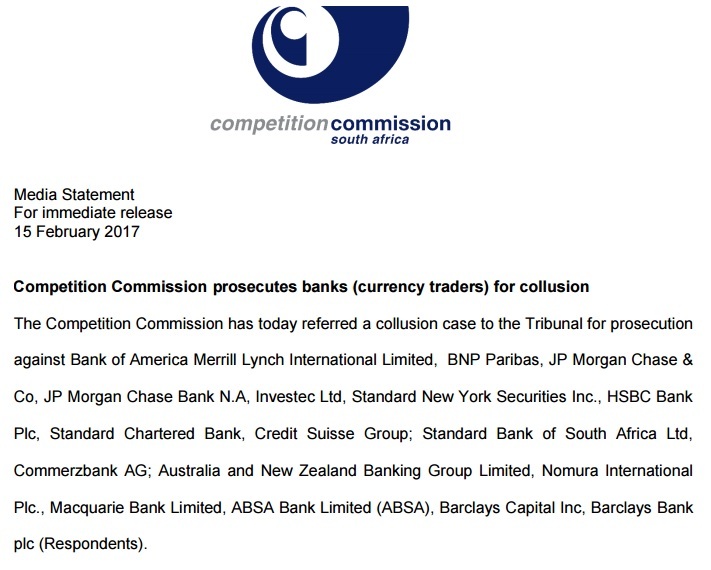 The South African Competition Commission on Wednesday referred a collusion case to the Tribunal for prosecution against 17 banks, including three of South Africa's big banks. The Commission has been investigating a case of price fixing and market allocation in the trading of foreign currency pairs involving the rand since April 2015. The commission said it found that from at least 2007, the respondents had a general agreement to collude on prices for bids, offers and bid-offer spreads for the spot trades in relation to currency trading involving US dollar / rand currency pair. It further found that the respondents manipulated the price of bids and offers through agreements to refrain from trading and creating fictitious bids and offers at particular times. The commission said traders of the respondents primarily used trading platforms such as the Reuters currency trading platform to carry out their collusive activities. They also used Bloomberg instant messaging system (chatroom), telephone conversation and had meetings to coordinate their bilateral and multilateral collusive trading activities. They assisted each other to reach the desired prices by coordinating trading times. They reached agreements to refrain from trading, taking turns in transacting and by either pulling or holding trading activities on the Reuters currency trading platform. They also created fictitious bids and offers, distorting demand and supply in order to achieve their profit motives.